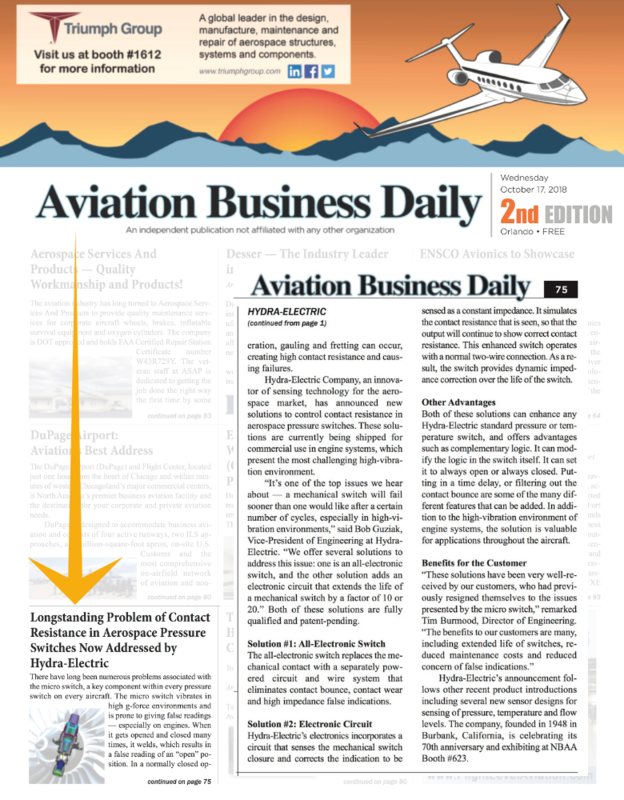 We made the front page of Aviation Business Daily’s Day 2 coverage of NBAA’s Business Aviation Convention & Exhibition (BACE). The article, Longstanding Problem of Contact Resistance in Aerospace Pressure Switches Now Addressed by Hydra-Electric, presents Hydra-Electric’s new solutions to control contact resistance in aerospace pressure switches. Quoting our own Vice-President of Engineering Bob Guziak, “A mechanical switch will fail sooner than one would like after a certain number of cycles, especially in high-vibration environments. We offer several solutions to address this issue: one is an all-electronic switch, and the other solution adds an electronic circuit that extends the life of a mechanical switch by a factor of 10 or 20.” Both solutions are fully qualified and patent-pending. The article noted that Hydra- Electric has recently introduced other new products, including several new sensor designs for sensing of pressure, temperature and flow levels. This entry was posted in #NBAA2018, Aerospace Engineering, Aerospace Events, Aerospace Industry Events, Aerospace Switches, Aircraft Sensor Design, Hydra-Electric News, NBAA, Press, Sensor technology and tagged #NBAA18, aerospace engineering, aerospace sensors, aerospace switches, aerospace trade show, aircraft engineering, aircraft sensor design, breakthrough sensing technology, business aviation, Hydra-Electric products, Hydra-Electric sensors, Hydra-Electric switches, NBAA2018, sensor technology. Bookmark the permalink.